Business critical information on the go. Our award-winning Mobile App is designed to provide your site managers and supervisors with up to date Site, Contract and Staff information and to enable them to carry out their tasks and update relevant data without having to return to the office to use a computer. Having the latest information to hand also equips them to provide on the spot answers to client queries and requests. CleanLink's Mobile App works alongside the Site Manager application. The app has been developed to work on iPhones, iPads and the iPod Touch (iOS v 6.0 or higher), so there's no need to carry a heavy laptop around. We also have a version for use on most Android Devices. With your staff using our Mobile App in the presence of customers and potential customers it gives a very ‘switched on’ impression. Giving your large clients a mobile device to do their own Audits is a deal clincher! The key benefit of using our mobile technology is to enable your Site Managers to work more effectively on site, by providing them with the latest information and allowing them to update this on site by using a range of functions. 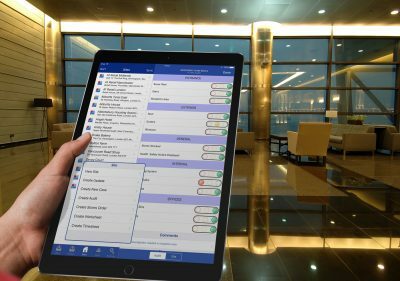 The mobile app's functionality includes site audits, staff timesheets, worksheets, stores orders and means they can perform key operational and administrative tasks without the need to complete paper forms and deliver them back to their office. This speeds up activity and response times and provides an immediate electronic record that can easily be shared with your customers. The combination of a native app and internet link to our secure gateway technology means that your managers can perform key tasks without the need to be online. Once completed, the output can subsequently be transmitted back to head office. This provides complete flexibility to operate anywhere at any time, with the knowledge that your data is safe and secure. Why not try the CleanLink Mobile Demo App? From either the iTunes App Store, or the Google Play Store, download the CleanLink app ‘CL Mobile’ on to your Device. This is a demonstration version, which gives you a full working model with six Sites and Staff. The ‘Inbox’ has partly completed Audits, Stores Order, New Staff Form, Site Review, Staff Review, Worksheet and a Complaint. You can create more from any Site. This version does not link to the web server for sending and receiving.